*WEIGHTED* Batting Practice Zone® Turf Protectors made with Vipol® Matrix Mesh to guard against divots during batting practice. NOW WITH GALVANIZED CHAIN FOR WIND. 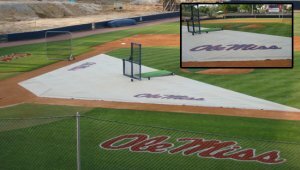 “Weighted” BP infield turf protector made with Vipol® Matrix Mesh to guard against divots during batting practice. NOW WITH GALVANIZED CHAIN FOR WIND. Galvanized chain in portions of edge hem and corners to keep tarp from blowing around.